Safari Destinations - "To self-drive or not to self-drive: That is the Question!" We have been debating the hot topic of self drives for years. The trend seems to be that more and more clients have independently travelled South Africa and Namibia by car, and as a result they think visiting Botswana in the same style is the natural conclusion. Botswana is wilder, has less infrastructure, less tarred roads, is a much more challenging destination. Self-driving in Botswana is for the adventurous, people that want a guarantee to see the amazing game in Botswana should always choose to travel with a guide, self-driving is possible in the National Parks and Game Reserves, the famous private concessions in the Okavango Delta or Linyanti can only be accessed by plane and visited with a professional guide. As your partner on the ground we selected a group of brave individuals to go and explore some of the parks of Northern Botswana, their mission was to test a variety of maps available in the local shops, the Tracks4Africa’s app, our self drive maps and the directions we hand out. 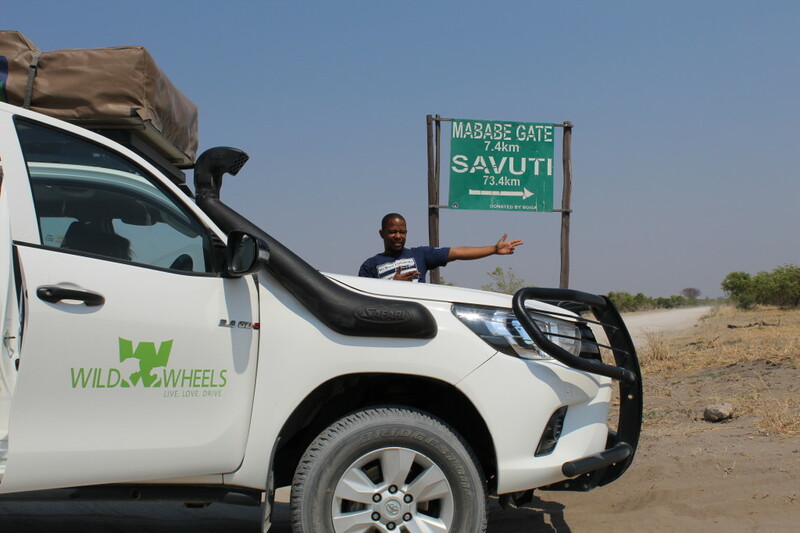 When I was initially asked if I would like to join a self-drive educational from Maun across Savute to Ngoma and into Namibia then back through the Panhandle to Maun I didn’t hesitate for a second. 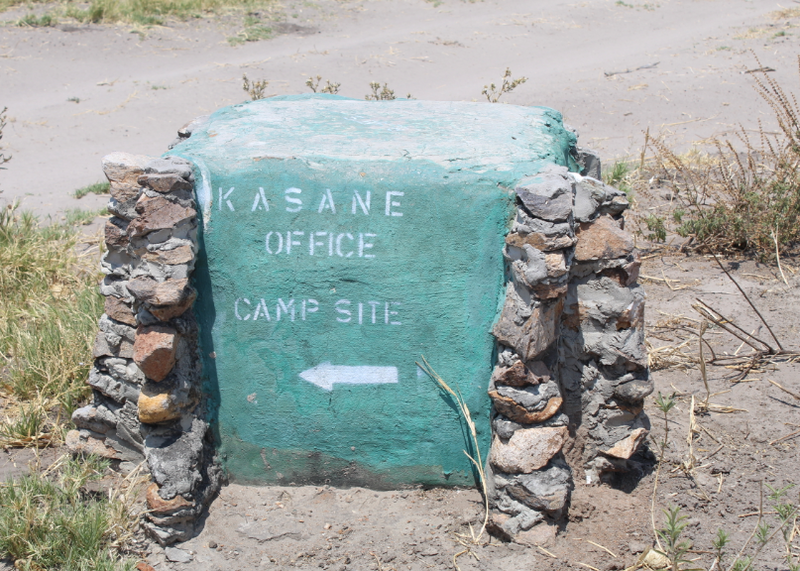 I was only concerned about traveling in the extreme heat of October (we often get more than 40 degrees in our so-called suicide-month), and the stories I had been told of people getting stuck in the thick sand in Savute and Chobe. The last time I was in Savute was in 2002 as part of a Wellness Club in High School where we put up sign posts to guide everyone visiting the Savute region, so this was an opportunity to revisit this area and to check if our signs were still around or the elephants had destroyed them. Cometh the hour, cometh the man… my moment had come. I joined Tlotlo, Brinny and Scarlet on this adventure. Being the farm boy that I am, I nominated myself to drive all the way through the park to Ngoma in Chobe. 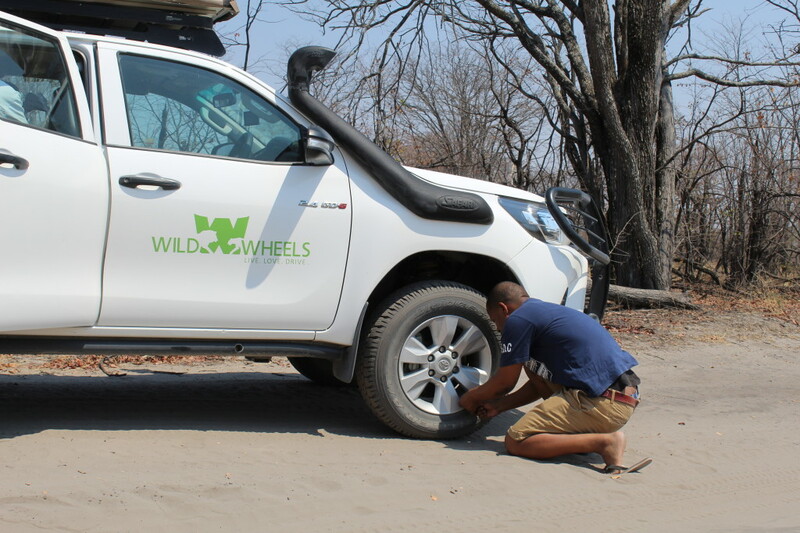 A Wild Wheels car was delivered and handed over the day before our trip, a Toyota Hilux double cab with 2 roof tents and plenty equipment. The handover is vital to make sure that all equipment needed for the trip is in the car and works properly. The vehicle came with a GPS system loaded with Tracks4Africa maps, a satellite phone, fridge, high-lift jack, spade, sand ladder and other necessary tools. We also got a proper briefing on how to use the tools, how to lower the tyre pressure. When hiring a vehicle from a local Botswana operator the equipment is guaranteed to deal with the conditions in the parks in Botswana. Clients choosing to travel through the parks need to make sure they have the right equipment. Ready, we left Maun early morning for our first destination, the recently reopened Belmond Savute Elephant Lodge (yes SD travels in style). The drive from Maun via Mababe to Savute took us about 5 hours of solid, but not fast, driving. After the Mababe Gate (guests that stay in lodges usually travel with a voucher from the lodge confirming that park fees have been paid, at the Gate only the payment for the vehicle needs to be made, it helps to have Pula at hand, the costs for locally registered vehicles is 10 Pula a day, foreign registered vehicles are 50 Pula a day) it became a little more challenging as the thicker sand began. We reduced the tyre pressure from the normal 250 to 180 bar. The Sandridge road is the most direct and easiest way to Savute even though the thick sand there has been a challenge to many. I was up to the challenge and hoping to get photos of us being stuck. To my surprise the sand was not that tough, I do not know if it was my bush baby driving skills or the Hilux just performed better than I had expected. With the vehicle on four wheel drive the stretch was easy enough. The main challenge of the road was a few kilometers after the Savute Gate on the side track which took us to Belmond Savute Elephant Lodge. Apparently, the trucks that came in for the rebuild of the lodge are the reasons for the state of the road. Extremely thick sand with deep burrow tracks, but nothing to worry about as long as you are driving a 4×4. From Savute to Ghoha Hills there is no thick sand, but the road requires one to drive at slow speed as it is bumpy and uneasy. At the Ghoha Gate it is advisable to ask the Wildlife officials which is the better route, as the direct route is not in great conditions. Here you drive left (north west) towards the Linyanti cutline and once on the cutline turn right and the road leads you all the way to Kachikau village. Before Kachikau the tarred road comes back to life and at the nearest fuel station we pumped back the tyres to 250 bar. After a night at Chobe Elephant Camp the crew crossed over to the Caprivi Strip in Namibia then spent a few nights in the Okavango Panhandle and back to Maun. 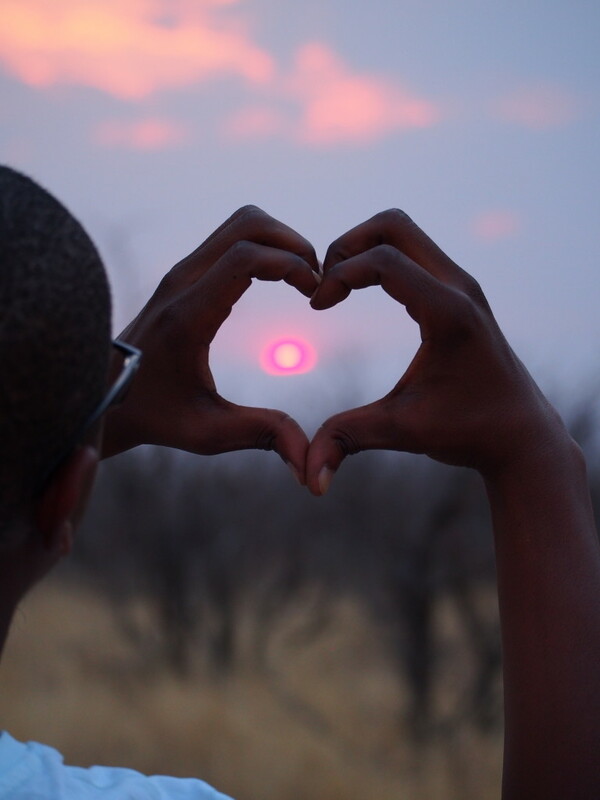 The border crossings at Ngoma into Namibia and Mohembo back into Botswana were all smooth and quick. The A3 road from Shakawe to Sehitwa has lots of potholes even though there were few patches of roadworks there and there. (We will speak more about the Panhandle section in a coming Blog). It is advisable to not self-drive in the rainy season, the terrain is difficult and chances of getting stuck in mud or having to cross water are high. Make sure your car is loaded with all the necessary equipment before you depart for your Safari (e.g. tools, GPS, satellite phone, working fridge, lockable doors, spare wheels), check all is in a good working condition. When switching from tarred/gravel road onto sandy roads reduce your tyre pressure and when going back on tarred road remember to increase the pressure. On sandy roads please switch onto H4 for 4-wheel drive at all times, if sand is too thick and car fails engage Low range to avoid getting stuck, the next car might only come by after 24hrs. Respect the animals on the road, especially Elephants. Do not stop and get out of the car in bushes, find a clear open space for your safety. Always ask the people working at the entrance gates which road is better or how do you proceed forward.